The brain circuits underlying motivation are critical for attention, learning, and decision-making. When these circuits have either not developed in a balanced and healthy way or have been chemically hijacked by addictions, challenging life circumstances can overpower the best of intentions. Programs intended to support parents and children facing adversity often find that participation is one of their greatest challenges. Dropping out of school and not participating in family support, job training, or addiction programs—all of these are reflections of motivation systems that have been disrupted by threat or hardship. Substantial scientific knowledge can inform the search for solutions by helping us understand what leads to these behaviors. 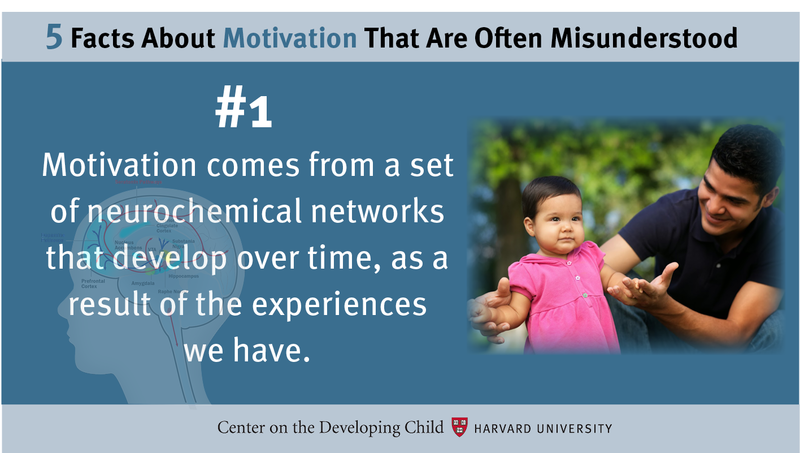 Support the development of motivation in early childhood programs. 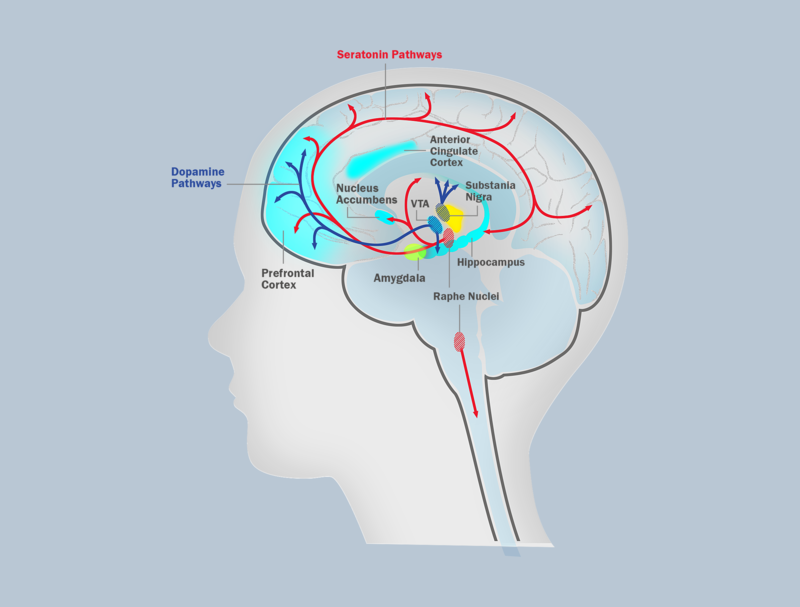 Knowing that the brain systems underlying motivation begin to develop in infancy, we can help children develop the balanced systems they will need later in life by starting in the earliest years. High teacher-to-child ratios, training in effective strategies to facilitate playful exploration and build self-efficacy, reducing stress in families’ lives, and skill-building for parents and providers of early care and education are all contributors to ensuring that the foundations of healthy motivation systems are built in early childhood. Shift schools toward a balance of positive feedback that supports intrinsic drivers. To improve student motivation, school systems should reduce emphasis on extrinsic rewards (like grades, tests, and performance-based recognition programs) and increase emphasis on constructive feedback and coaching to improve performance. Support and reward exploration, praise effort, and use successes in one area to inspire effort in another, while avoiding punishment-based approaches. Focus response to addiction on treatment rather than punishment. Policies and programs relating to addictions can be improved by understanding that addictive drugs rewire and redirect motivation and reward systems. Knowing that craving or wanting addictive substances happens below the conscious level means that solutions must also occur on the physiological or biological level, rather than expecting awareness of potential punishments to change behavior. Include motivation-building supports in programs for adults who care for young children. Foster a growth mindset by praising effort, looking at mistakes as learning opportunities, and monitoring progress toward goals. Incorporate and test promising methods for goal-setting and keeping people on track to achieve self-defined goals. These approaches can not only improve retention in programs, but can also enable parents and caregivers to model and support these skills and mindsets in children. Replace punitive approaches to program retention with methods that reduce stress, provide positive feedback and social/peer support, and demonstrate quick successes. Many programs designed to help families with young children struggle to engage parents to participate actively and stay with the program long enough to truly benefit. Many factors contribute to program engagement and retention, ranging from inconvenience of timing, location, and transportation, to cost, child care needs, and competition with other activities or the needs of other family members and friends. 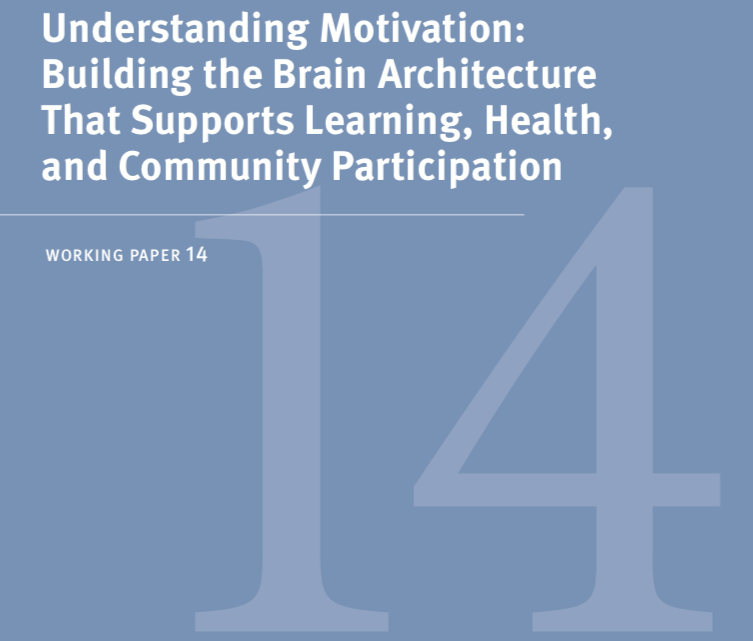 Along with addressing those factors, programs can increase motivation to participate by making it easier to rejoin after a lapse (reducing stress), helping participants achieve small successes quickly (building self-efficacy), and making participation more rewarding by praising effort (strengthening a growth mindset).